Architect Magazine asks Barbara Campagna to share her thoughts about architects, climate change and COP21. Urban Green Council reposts Barbara Campagna’s 1913 blog on Preserving MidCentury Modern architecture as a precursor to their upcoming annual Conference – Modern All Over Again. Curbed reports on Buffalo's architecture - from Richardson to Modernism, with a quote from Barbara Campagna on the adaptive use potential of Paul Rudolph's Shoreline Apartments. The Atlantic's CityLab writes an excellent evaluation of the complexities involved in trying to save Paul Rudolph's Shoreline Apartments. Barbara Campagna's advocacy efforts are highlighted in "The Slow Death of a Brutalist Vision for Buffalo." In honor of the 50th anniversary of the NYC Landmarks Preservation Commission and law, Barbara Campagna speaks on the "Women in Preservation" roundtable at Pratt Institute on May 1st, 2015. Can sustainability and history preservation go hand in hand? Barbara Campagna to speak at Urban Green Council's lecture series in TriBeCa, January 22, 2015. Going to Greenbuild the week of October 21st, 2014? Barbara Campagna and colleagues presenting Wednesday morning, "Greening What's Already Here: LEED EB:O&M is the New Preservation Tool." The October issue of DOCOMOMO's newsletter features an article by Barbara Campagna, Documenting Buffalo's Modernism. The Seward City News details Barbara Campagna's involvement in the Jesse Lee Home rehabilitation. Barbara Campagna is interviewed about her work on the Jesse Lee Home in Seward, Alaska. The Friends of the Jesse Lee Home, client of BAC/Architecture + Planning, acquires the Jesse Lee Home, a project of BAC/Architecture + Planning. A review in the Buffalo News of the modernism forum that Barbara Campagna helped to organize regarding Paul Rudolph's Shoreline Apartments. Preservation Buffalo Niagara is hosting a modernism forum on February 27, 2014 at the Buffalo Central Library. Barbara Campagna is a featured speaker. This month's Docomomo_US newsletter is a special brief on modern public housing. Barbara Campagna wrote the cover article on Buffalo housing complexes that are under threat. The Architect's Newspaper lists their top featured articles for 2013. 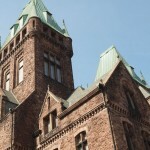 "Buffalo's Boom" starring the Richardson Olmsted Complex and a tour by Barbara Campagna for the reporter, tops the list! What should be done with the largest building in New York State outside of NYC? The former HSBC Tower in Buffalo, designed by SOM in 1972, is about to become vacant. But other cities have figured out how to remake their similar skyscrapers. Barbara Campagna contributes her thoughts. The Midtown East Rezoning plan has been paused. Future Cities reports on what a more balanced plan might look like, with quotes from Barbara Campagna. Weighing in on the New York Public Library Conversion Plans. Barbara Campagna reviews the controversy over the New York Public Library's controversial retrofit plans designed by Norman Foster in her latest UBM Future Cities blog. Can Midcentury Buildings Be Saved? Barbara Campagna explains how in her latest UBM Future Cities blog. Nice coverage on the Richardson Olmsted Complex rehabilitation by the local NBC affiliate, with an interview of board member Barbara Campagna. The Richardson Olmsted Complex is featured on the local ABC affiliate with an interview of board member Barbara Campagna. The Richardson Olmsted Complex is on target to opening in 2016 - boutique hotel, conference center and architecture center. It's a great preservation story and one of the most significant rehabilitation projects in the country, with quotes from Barbara Campagna. LEED bashing has been popular lately. UBM Future Cities presents a more balanced view, with quotes from Barbara Campagna. 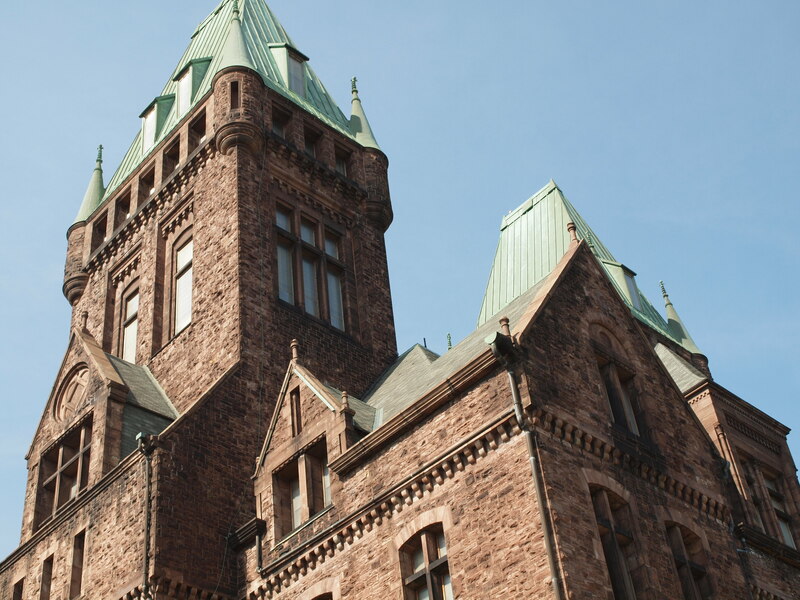 Buffalo's Booming and Barbara Campagna shows The Architect's Newspaper how the Richardson Olmsted Complex is leading the way. Do Green Museum Standards Really Exist? Can They? Barbara Campagna ponders that question in her latest UBM Future Cities blog. UBM Future Cities invites Barbara Campagna to be their sustainability and preservation voice. How Old Buildings Take the LEED on Green, Barbara's first blog for Future Cities, the global community for 21st century city decision makers. DOCOMOMO reposts the most recent True Green Cities blog in their current newsletter - Green, Modern and a Plea for Gray. Barbara Campagna is speaking about the sustainability efforts of the Haas-Lilienthal House at AAM's Sustainability and Museums Summit in Baltimore on May 21st, 2013. Barbara Campagna is the keynote speaker at this year's Gulf Coast Green Conference in Houston, May 2, 2013. Barbara Campagna speaking to students at her alma mater, Columbia University, April 3, 2013 about the Richardson Olmsted Complex. Barbara Campagna joins professional team to assist in the adaptive reuse of the Bethlehem Steel Administration Building in Lackawanna, NY. The Fashion Institute of Technology in NYC, FIT, celebrates its sustainability-focused professors, including Barbara Campagna. One of BAC[A+P]'s projects, the Haas-Lilienthal house, has been included as one of the National Trust's first slate of 34 National Treasures. Barbara Campagna to speak in the closing plenary of the International Summit of this year's Greenbuild conference, November 13, 2012. Barbara Campagna to speak at the University of Texas at Austin Architecture Lecture Series, Austin TX - The Perfect Match: Sustainability & Preservation - Wednesday, October 17th, 2012. Barbara Campagna to present keynote address at Minnesota Statewide Preservation Conference in Fergus Falls, MN - The Perfect Match: Sustainability & Preservation - Thursday, September 13th, 2012. Millard Fillmore Gates Circle Hospital Adaptive Use will bring creativity to downtown Buffalo. Barbara Campagna is the preservation architect for the team who is transforming the former homeopathic hospital into a veterinary medical school. Barbara Campagna to teach workshop at Texas Society of Architects Annual Convention in Austin, TX - Rethinking Historic Buildings Through a Green Lens - Thursday, October 18th, 2012. WKBW reports on the award of the Millard Fillmore Gates Circle Hospital site by Kaleida to the development and design team led by Affinity Partners. Barbara Campagna with BAC/Architecture + Planning, PLLC is the preservation architect for the team. WIVB reports on the award of the Millard Fillmore Gates Circle Hospital site by Kaleida to the development and design team led by Affinity Partners. Barbara Campagna with BAC/Architecture + Planning, PLLC is the preservation architect for the team. Business First reports on the award of the Millard Fillmore Gates Circle Hospital site by Kaleida to the development and design team led by Affinity Partners. Barbara Campagna with BAC/Architecture + Planning, PLLC is the preservation architect for the team. WGRZ reports on the award of the Millard Fillmore Gates Circle Hospital site by Kaleida to the development and design team led by Affinity Partners. Barbara Campagna with BAC/Architecture + Planning, PLLC is the preservation architect for the team. The Buffalo News reports on the award of the Millard Fillmore Gates Circle Hospital site by Kaleida to the development and design team led by Affinity Partners. Barbara Campagna with BAC/Architecture + Planning, PLLC is the preservation architect for the team. Buffalo Rising reports on the award of the Millard Fillmore Gates Circle Hospital site by Kaleida to the development and design team led by Affinity Partners. Barbara Campagna with BAC/Architecture + Planning, PLLC is the preservation architect for the team. Traditional Building Magazine asks Barbara Campagna to write an editorial on the Culture of Reuse, June 2012. New York City, Historic Districts Council, Old is Green, June 20, 2012. University at Buffalo, School of Architecture and Planning, Barbara Campagna workshop facilitator for Sustainable Preservation Workshops in Buffalo and New York City. Residential Architect, a magazine of the AIA, quotes Barbara Campagna in an article entitled, "Guest Perks: Can Motel Retrofits Offer an Investor-Friendly Model for Affordable Housing?" San Francisco Architectural Heritage posts "The Greening Plan", the Sustainability Management Plan for their historic Haas-Lilienthal House prepared by Barbara Campagna, on their website, March 1, 2012. The Washington Times features a cover story on repairing old and historic windows, “Repairing Windows Can Beat Replacing,” January 12, 2012 by Kim O’Connell with extensive commentary by Barbara Campagna. Residential Architect, a magazine of the AIA, presents a feature in the "AIA Voices" column on Barbara Campagna, September/October 2011. "Preservation's Prime-Time: Past, Present and Future are not mutually exclusive conditions." Buffalo News article , October 22, 2011, on the University of Buffalo's School of Architecture & Planning announcement regarding the launch of their "preservation agenda" - which Barbara Campagna is developing. WIVB in Buffalo follows Barbara Campagna on a tour through the Richardson Olmsted Complex. October 20, 2011. Barbara Campagna to speak at the Vancouver Heritage Foundation's annual conferenceNovember 3rd - 5th, 2011. Announcing Barbara Campagna's lecture in Vancouver, BC November 3rd, 2011. "Green Considerations and Renovations" - Barbara Campagna was interviewed for the side bar in this article in Builder News Magazine (pp. 27-28). The Surprising Architectural Legacy of Buffalo, NY with quite a lovely tribute to Barbara Campagna, too! In The Atlantic Blog, July, 18, 2011; and Buffalo's Business First online journal. Barbara Campagna to speak in Houston for Preservation Month. USGBC Texas Chapter announces "The Perfect Match: Sustainability & Preservation." Houston Mod announces "The Perfect Match." Citizen's Environmental Coalition announces "The Perfect Match." Preservation Texas announces "The Perfect Match." National Preservation Leaders to Speak in Indy,”Inside Indiana Business, March 11, 2011. “More Low Tech Tips for Keeping Cool,” Treehugger, July 2009, author Lloyd Alter. “Talking With Barbara Campagna About Preservation, Sustainability and LEED,” Preservation North Carolina Blog, November 2008, author Glenn Perkins. “Can Historic Modern Architecture Go Green?” inform (the AIA Architecture + Design Journal of the Mid-Atlantic), 2008: number three, p. 10, author Kim O’Connell. “Now Presenting…The Twentieth Century: The National Trust Protects Modernism & The Recent Past”, Preservation, pp. 8-10, May/June 2008, author Kim O’Connell. “Preaching and Practicing: From Promoting Policy to Upgrading Sites, the National Trust goes Green in a Big Way”, Preservation, pp. 10-12, Jan/Feb, 2008, author Kim O’Connell. “Architectural Center Envisioned for Richardson Complex,” The Buffalo News, September 17, 2007, author Mark Sommers. “This Time, Farnsworth House Dodges Flood,” Chicago Tribune, August 30, 2007, author Blair Kamin. “Difficult Cleanup Lies Ahead for Soaked Midwest,” NY Times, August 25, 2007, author Nick Bunkley. “Finding Common Ground”, Traditional Building, June 2007, pp. 16-20, author Kim O’Connell. “Notables & Heroes,” AIA Seattle Newsletter, May 2006. “Fine Old Courthouse to Get Major Facelift,” Seattle Times, March 31, 2006, author Natalie Singer. “Medals & Medalists Adorn Convention’s Final Theme Session,” AIA Architect, June 2002. Chach, Mary Ann, et al. The Shuberts Present: 100 Years of American Theater. New York: Harry N. Abrams, Inc. Publishers, 2001. (pp. 80-89, The Shubert Theatre, New York City). “Pubic Lives, Giving Broadway a Makeover,” NY Times, August 9, 2001, Theatre section, author Glenn Collins. “Streetscapes: National Arts Club,” NY Times, September 21, 1997, Real Estate Section, author Christopher Gray. “Curtain Rises on Shubert Rehab,” Newsday, April 4, 1996, author Patrick Pacheco. 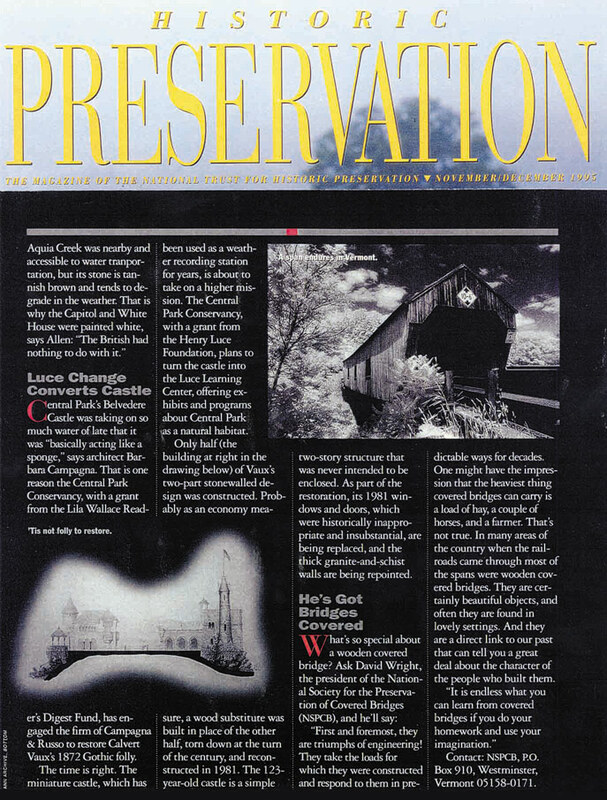 “Luce Change Converts Castle,” Historic Preservation, Nov/Dec 1995. 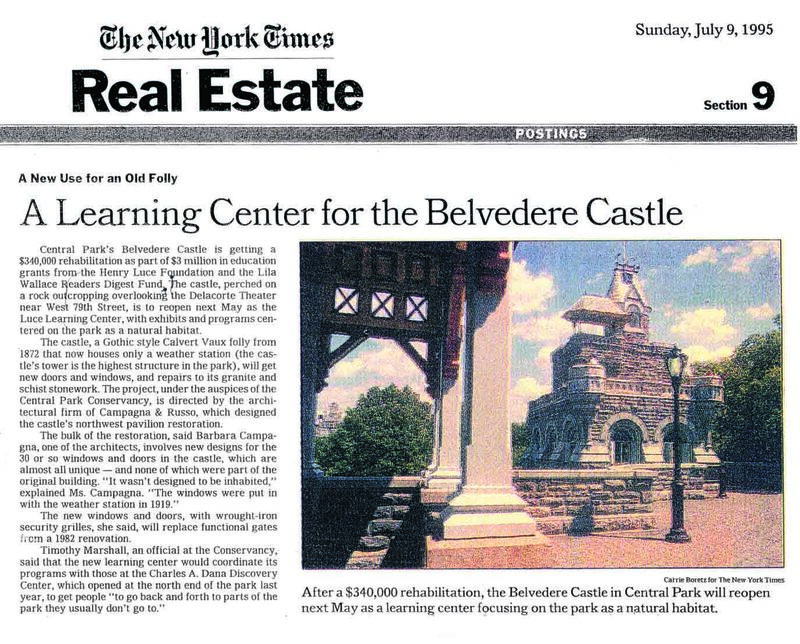 “A Learning Center for the Belvedere Castle,” NY Times, Sunday July 9, 1995, section 9, page 1. 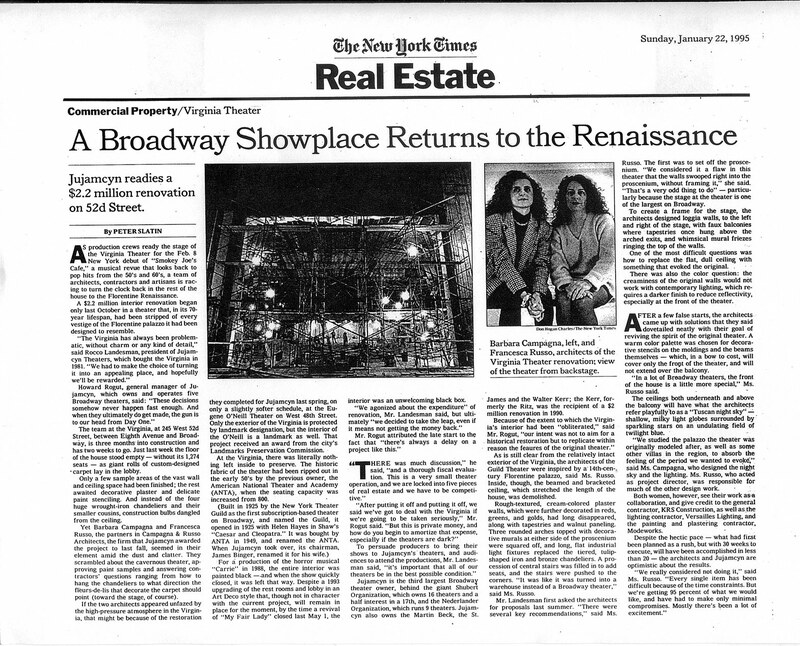 “A Broadway Showplace Returns to the Renaissance,” NY Times, January 22, 1995, Real Estate Section, author Peter Slatin. “Behind the Scenes, Campagna & Russo Architects,” The Buffalo News, June 26, 1994. “Landmarks Preservation Commission Awards; 13 Projects Win Citations for Enhancing the Urban Environment”, NY Times, June 12, 1994. “Public Invited to Look In on Wright Windows”, The Buffalo News, May 1, 1989. Central Park’s Belvedere Castle was taking on so much water of late that it was “basically acting like a sponge,” says Architect Barbara Campagna. That is one reason the Central Park Conservancy has engaged the firm of Campagna & Russo to restore Calvert Vaux’s 1872 Gothic folly. from Historic Preservation, Nov/Dec 1995. “Modern architecture is often sculptural and experimental,” Campagna stated, raising questions about whether sustainable restorations must exactly replicate novel materials and assemblies or whether a building’s general concept is the more important consideration... “But when is the Glass House no longer the Glass House?” she asked rhetorically... from inform, 2008 #3 p. 10. ..”We were pretty sure we were going to get water in the house,“ added Barbara Campagna, the Trust’s Director of Architecture, who was at the house Thursday to discuss, by coincidence, an update of its disaster management plan. Inventing a disaster management plan on the spot, Campagna and others borrowed a flat bottomed aluminum boat and rode through the brown floodwater to the skeletal white house...” from “This Time, Farnsworth House Dodges Flood,” Chicago Tribune, August 30, 2007.